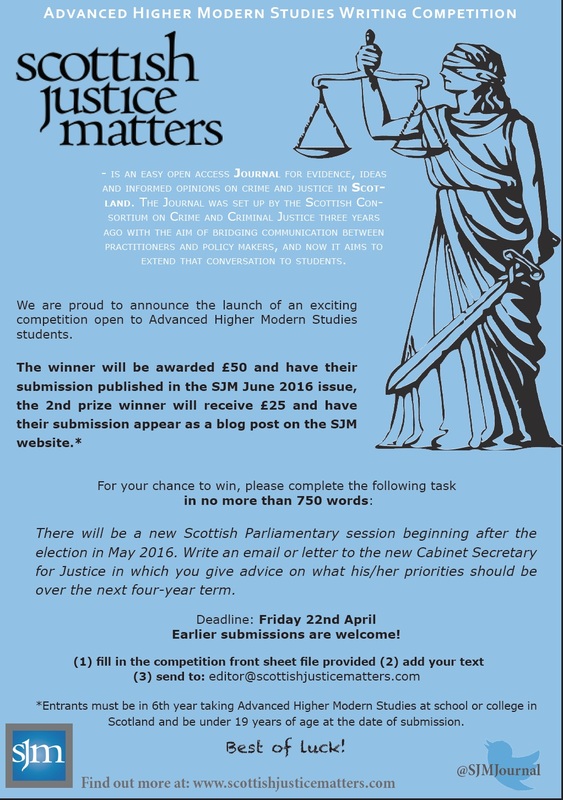 Modern Studies essay prize: what do you think should be Justice priorities in Scotland? The SJM team is proud to announce the launch of an exciting essay prize competition open to Advanced Higher Modern Studies students. 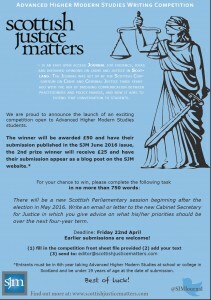 The winner will be awarded £50 and have their submission published in the June 2016 issue of the SJM: the 2nd prize winner will win £25 and have their submission appear as a blog post on the SJM website. Your entry must be no longer than 750 words including the title. You must be in 6th year taking Advanced Higher Modern Studies at school or college in Scotland and be under 19 years of age at the date of submission. The deadline for entry is Friday 22nd April. Submissions received after that date will not be considered.